I think it was not bad for my first try. According to online sources, lorighittas are typical of the Sardinian town of Morgongiori (province of Oristano). 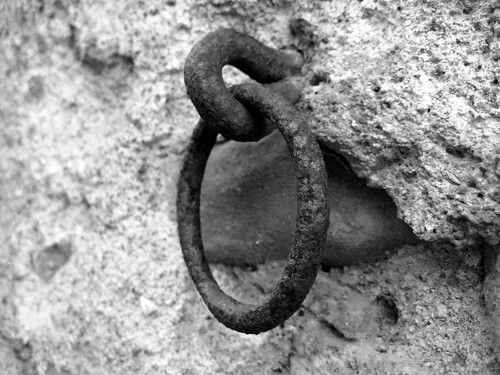 As explained on this page, the name comes from sa loriga, a Sardinian word that indicates the iron ring fixed to the wall of a house to which horses or donkeys were tethered. In this video (in Italian), the woman interviewed talks about the tradition of making lorighittas. She adds the salt to the water rather than the semola (in this post, there is a brief discussion of the various products obtained by milling durum wheat) and calls that battezzare (to baptize). She says that the pasta is fully dried, a process that takes several days. I assume the drying is done for storage. Other interesting things from the video are the beautiful basket on which the lorighittas are laid out to dry and the repurposed meat grinder. Instead of a basket, I used a cookie sheet lined with a cotton kitchen towel (see top photo). I then covered the lorighittas with another towel. To make lorighittas you roll the dough into a string that is thin enough, but not so thin as to break during the shaping. The meat grinder made a lot of sense, so I decided to try using it. Unfortunately, the disk I have (only one, since my meat grinder is basically an antique) does not produce smooth strings, so my experiment did not end satisfactorily. I went back to rolling with my hands. Shaping the lorighittas requires a bit of attention. In this video, you can see my hands at work. A quick comparison with the hands of the women in the previous video shows that I have a little way to go before I can contemplate making lorighittas for a large party. But I am determined to improve with practice. Considering that I had chosen a complex pasta shape, I thought I would go easy in terms of sauce. Having missed last month's edition of Pasta Please, I wanted to comply with this month's theme, chili peppers, so I made simple tomato sauce using my strained roasted tomatoes and I spiked it with peperoncino. See this bunch of peperoncini? I have had them for some time and I can assure you they've lost none of their potency. I bought them during my only visit to the farmers' market in Milan, shortly after they opened it. I had a mixed experience there, but walked away with, among other things, a pretty bunch of peperoncini, fiery in both color and flavor, which I have been using ever since. Make a dough with the three ingredients and knead until nice and smooth. [This post (with video) talks about how to make semolina pasta dough] Let the dough rest, covered, for at least half an hour. Roll the dough into a thick salami and cut it into pieces. Keep them covered while you shape the lorighittas. You don't want the dough to dry out. Roll each piece into a thin string, not thicker than 1/6 inch / 0.4 cm diameter (see Note below). Wrap the string around the four fingers twice then break the dough and join the two ends by pressing lightly. Note: if the rings come out too long and you have trouble with the next step, try using only three fingers. Thread one loop into the other a few times until the two strands are woven into a sort of two-strand braid. Continue until all the dough is used. You may want to dust lightly with flour the surface where you lay the shaped lorighittas, to prevent them from sticking. And you may need to wet your hands if they get too dry while shaping the pasta (it happened to me). The first time I made the pasta, I cooked it a few hours after I had shaped it. The second time, I dried it for a couple of days to see how it looked. Note: someone whose mother is from Morgongiori kindly commented on FB that the string of dough must be thinner than it appears in my version of lorighittas. I am aware that in my first rendition the string of dough was a bit thick. Also, the perspective of the close-up photos is somewhat tricky. Finally, I learned by myself, just watching a video, so I make no claims about the authenticity of my lorighittas. As I mentioned above, the dough should be thin, but not so thin as to break when you roll it around your fingers. I am sure my technique would improve if I could spend some time in Morgongiori with the pros and if I am ever in Sardinia, you can be sure I'd visit the town and look for a mentor. In a small saucepan, warm up a bit of olive oil, then add garlic and chili pepper. Choose the chili pepper's size and how you cut it based on how spicy you want your sauce. In my household, the preference goes to mild spicyness, so I chose a smallish peperoncino. I left it whole and snapped off the stem and the small cap to which it is attached. Cook gently for a couple of minutes, then add the tomatoes. Bring to a simmer and cook for 7-8 minutes. Remove garlic and chili pepper. Adjust salt, to taste. Note that this will make more sauce than you need to dress the pasta, but once you have the sauce ready, I am sure you'll find ways of using it, like making more handmade pasta. If you find that the sauce is too hot for your taste, make another batch without peperoncino and then blend the two. Bring a pot of salted water to a rolling boil, then toss the lorighittas in it (what in Italian we call: buttare giù la pasta). The time needed is a bit variable, depending on the size of lorighittas, how dry they are, etc. Dry lorighittas take quite some time to cook, so be patient. Taste and stop the cooking when the lorighittas are ready. Pour a glass of cold water in the pot, stir and drain the lorighittas. Place in a bowl, distribute some tomato sauce (reheated if necessary), and toss. Finally, sprinkle some cheese on top and serve immediately. Alternatively, while the pasta is cooking, place a few tablespoons of the sauce in a small skillet and warm it up. Drain the pasta and drop it into the skillet with the sauce. Stir well over medium-low heat for a minute. Sprinkle some of the cheese and stir one last time. Plate and sprinkle a bit more cheese on the top. Serve immediately. Every time I make a new pasta shape, I think it is the prettiest I have made so far. Lorighittas stand well with the spicyness of the peperoncino in the sauce. I honestly liked the fresh version a bit better, but I am glad I dried one batch. I will do it again and complete the drying process, so I can store the pasta for later use. This is my contribution to the current edition of Pasta Please, a new pasta-centric event created by Jacqueline of Tinned Tomatoes and hosted this month by Shaheen of Allotment2Kitchen. The theme this month is: chillies (a.k.a. chili peppers). The top photo is my contribution to edition #81 of Black and White Wednesday - A Culinary Photography Event created by Susan of The Well-Seasoned Cook, now organized by Cinzia of Cindystar, and hosted this week by Lynne of Cafe Lynnylu. or launch the lorighittas al sugo piccante audio file [mp3].